Sam Reinhart may fill into Brian Gionta's spot while Gionta nurses his lower body injury. Gionta had been playing with Evander Kane and Jack Eichel in the practice. Brian Gionta will miss the opening game of the season for the Buffalo Sabres after sustaining a lower body injury in Tuesday’s practice. Gionta is currently listed as day to day with his injury. Gionta was penciled in as the right wing on the line with Jack Eichel and Evander Kane throughout the preseason. 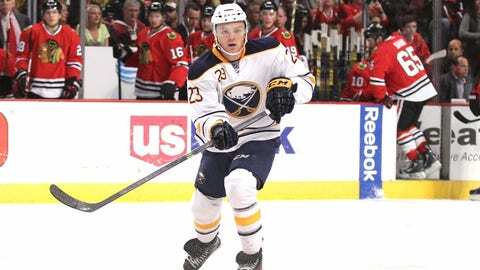 Rookie Sam Reinhart has taken Gionta’s spot in his absence. It’s not immediately clear if Reinhart will play with Eichel and Kane for the opener, but regardless of where he plays, Reinhart will be ready to make his 2015-16 debut. "I think first off, I’ll play with as much confidence as possible," Reinhart told Buffalo Sabres’ writer Jourdon LaBarber. "No matter who I’m playing with, I’m playing with good players, so (using) them to my advantage and I think keeping things simple in this league will benefit me." Reinhart played in nine games for the Sabres last season, but was sent back to the WHL after his brief tryout. He finished with 19 goals and 65 points in 47 games last season at the junior level.